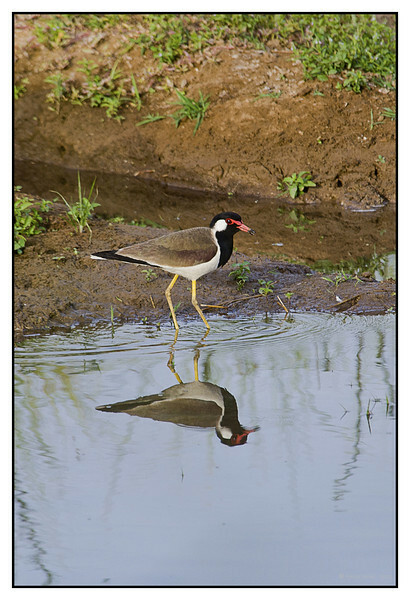 http://hershy.smugmug.com/Travel/Ranthambhore/RT-June-2011/17444320_Qps9C3 The Red-wattled Lapwing (Vanellus indicus),about 35cm long, is a lapwing or large plover, a wader in the family Charadriidae. It has characteristic loud alarm calls which are variously rendered as did he do it or pity to do it leading to colloquial names like the did-he-do-it bird. Usually seen in pairs or small groups not far from water but may form large flocks in the non-breeding season (winter). http://en.wikipedia.org/wiki/Red-wattled_Lapwing It was a great feeling to see the Paradise flycatcher picture on top of the Daily gallery this morning (India time). Thank you friends! I'm out town attending a three day conference (job related) that ends tomorrow........reason why I am late posting on this one. Beautiful capture of this pretty bird, nice reflection. Another great bird picture - excellent reflection.